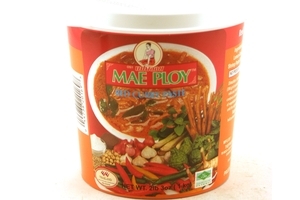 Mae Ploy Red Curry Paste in 35oz (995g) tub. Red Curry Paste is used to make various curry soups and stir fry dishes. Mae Ploy Brand is recognized in Thailand as a high quality export product with rich taste and authentic flavor. Product of Thailand. All Natural ₪ | No Coloring ۾∞ | No Preservative ≠ | Halal Certified حلال . Dried red chilli, garlic, lemon grass, salt, shallot, galangal, shrimp paste (shrimp), kaffir lime peel, pepper.